A 12min read about why and how to make your vacation rental pet-friendly. 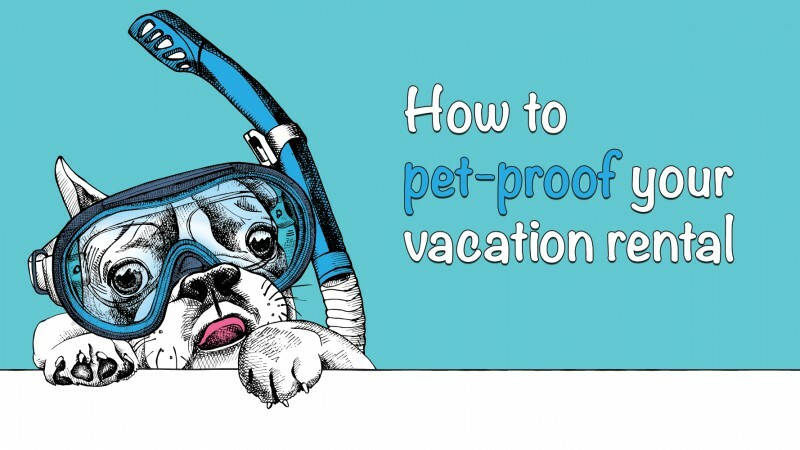 This is the ultimate guide to making your vacation rental dog & pet proof. Why make your vacation rental pet-friendly? Let’s dive into statistics. It’s widely known making your vacation rental pet-friendly will increase bookings. Why? Additionally, FIREPAW conducted a study which found pet-friendly rentals have the ability to make 20% – 30% more income than vacation rentals that don’t allow pets. They also found pet owners are willing to pay higher damage deposits for their pets. The reason pet owners & dog owners are willing to pay more for dog-friendly & pet-friendly vacation rentals is because travelling with your pet is extremely hard. By providing a pet-friendly vacation rental, you’re solving half their problems. Are more bookings worth the stress of making a vacation rental pet-friendly? In short, yes, providing the vacation rental has been pet-proofed. Untrained dogs & cats have the potential to ruin your furniture, stain your carpets and leave total destruction even the damage deposit doesn’t cover. So it’s important to pet-proof your property. If you’re unwilling to accept all pets, I highly suggest you focus on dogs. It’s only worth accepting pets if the stress & cost doesn’t outweigh the increased income. Below I share some ideas about how to make your vacation rental truly pet-friendly & pet-proof. Before any guest stays, it’s important to clearly set out & notify them of your pet rules. You may think picking up poo is obvious to guests. It’s not. Make rules, notify travellers & guests and frame them in your property. A great way to subliminally enforce rules is to provide the correct equipment at the correct moment, leaving guests with no excuse. I’ll talk more about this in the points below. The ideal pet-friendly flooring is scratch-resistant & stain proof that’s comfortable and looks good. Solid floors can appear plain, so why not add rugs? Rugs are great ways to improve design & comfort because they’re easily washed or disposed of if something does go wrong. Another great way to “pet-proof” your vacation rental is to set boundaries. Some areas of your home may contain valuable items which are off limits to pets. Guests often ignore rules like, “Don’t let your dog in the bedroom”. 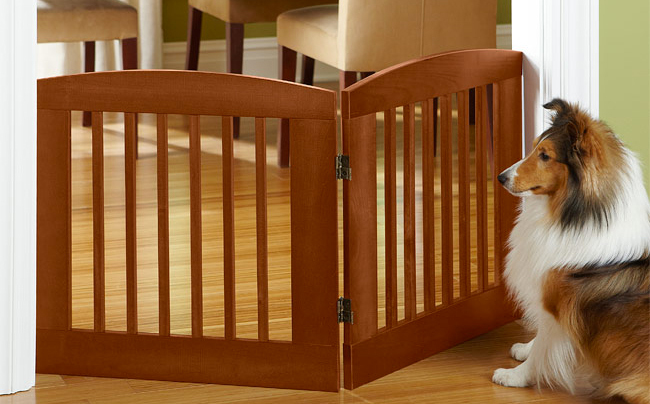 By providing child gates, it’s easier for the guest to follow your rules. Talking with owners & guests, one of the most damaged items is blinds, shutters or curtains. They’re constantly being chewed by dogs or scratched by cats. Covering your windows are essential for privacy, so the best option is to avoid blinds and go for cheap curtains. So make sure your damage deposit covers them! Obvious but important… keep your vacation rental minimal around the floor because that’s where most pets spend their time. Meticulously scan your property and it’s decorations. Make sure they’re out of reach for even big dogs. Also, avoid flimsy items that smash easily. Sofas are usually a boundary guests ignore because either their pets are allowed on sofas or they’re untrained. 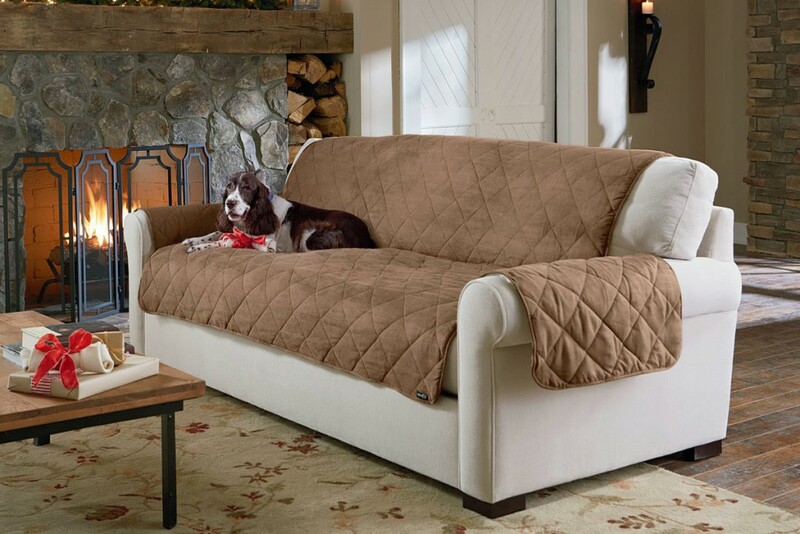 Use pet-friendly fabrics like heavy & tightly woven cloth. Also, avoid plain fabrics because they tend to show marks. Patterns or bright colours are best because they good at concealing marks. It’s hard for guests to bring all the necessary gear it takes to look after a pet. By providing all the tools, guests & pets are happy which translates into less mess & destruction! Travelling pets are likely to be on-edge. Because guests inevitably leave pets to their own devices, they’re anxious and are more likely to cause anarchy. It’s a great idea to include plenty of distractions because it also stops dogs chewing on your furniture. Tip: In your pet rules, encourage guests to leave the bones you provide to their dogs if they leave the house. It’s common to have low-lying cleaning cabinets and electronic cables in your home. These are dangerous and interesting items for pets. Therefore, it’s important to keep your low-lying cabinets locked and cables tied away. Wood looks beautiful but it’s also extremely “chewable”. Chairs and bed posts are common for dogs to either scratch or chew. Either warden off areas with lots of wood furniture, provide distractions, remove it or accept it may get damaged. As mentioned earlier, guests are willing to pay more for a pet-friendly vacation rental. Pets will cause more damage than regular guests, so it’s important to cover your costs! Create a different damage deposit that’s only applicable for guests with pets. We’ve also seen owners adding “pet fees” to cover other costs like pets supplies, food, extra linen, beds etc. It’s likely that pets may leave a smell behind which isn’t good for making your vacation rental pet-friendly. Deodorizers are a great way to remove or mask smells. Alternatively, providing guests with scented sticks or candles may help the property to remain smelling lovely. Another common barrier to making your vacation rental pet-friendly is preventing loud noises, especially if you have nearby neighbours. Dogs are usually the culprit. It may be handy to monitor your vacation rental for loud noises to alert your guests if their dog is barking. We all know how irritable dogs can be if they’re not walked. Guests may leave dogs on holiday because they don’t know the local area and where’s best to take pets. Also, if travellers are coming from abroad, they’ll need to know where the local vet is. Relaxed and calm pets are less likely to cause mayhem and believe it or not, there are steps YOU as an owner can take to calm guests pets. 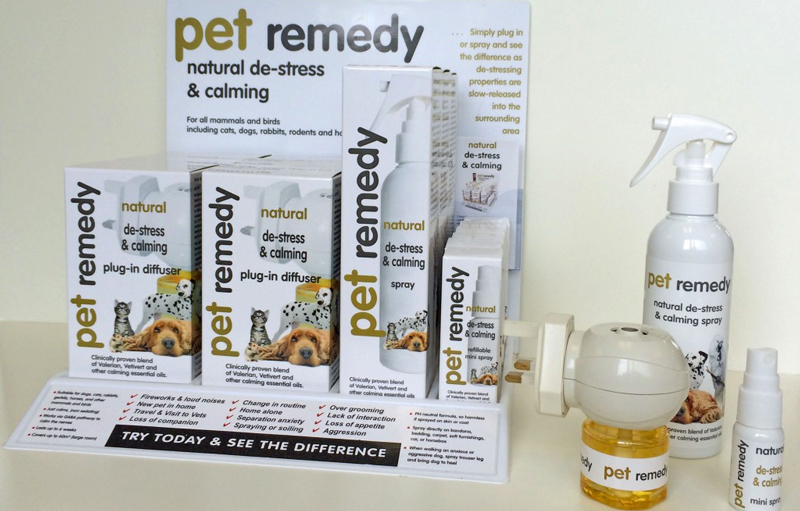 A company called Pet Remedy have a suit of natural products that are scientifically proven to calm pets using valerian root extract. You can even buy an atomizer to constantly release the herb extract. Other options include playing music to calm pets, especially if the pets are scared of fireworks or storms. Dogs & cats hear differently to humans and actually have a preference to what music they’d prefer. Here’s a YouTube playlist specifically created for dogs. Have playlists, speakers and videos lined up for your guests to play. Again, the first step to making your vacation rental pet-friendly is having strict guidelines for guests and a clear rental agreement that stipulates the terms of various outcomes. The second step is making your guest aware of your rules. Then by applying some of the other steps mentioned above, there’s no reason why you can’t take full advantage of this amazing opportunity and maximise your income by making your vacation rental pet-friendly.